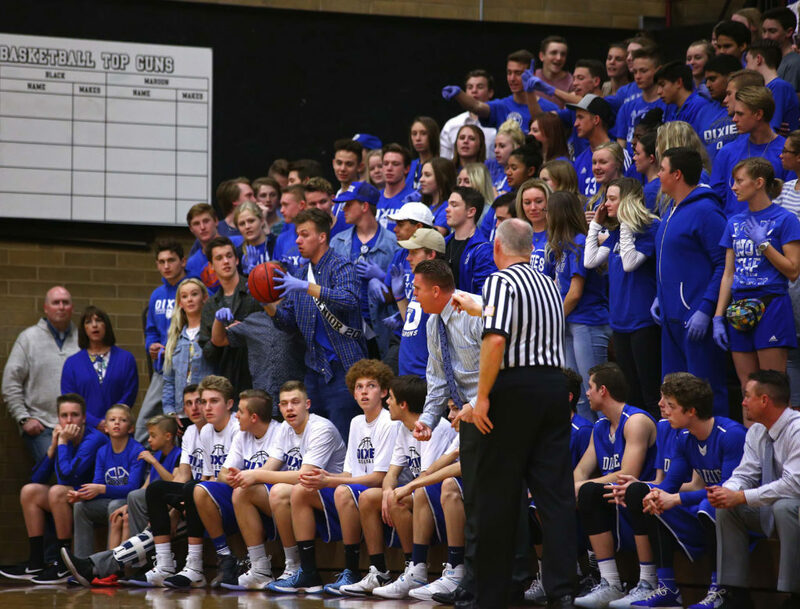 ST. GEORGE – Desert Hills fans must have been rooting for Pine View Wednesday night — although they’ll never admit it. 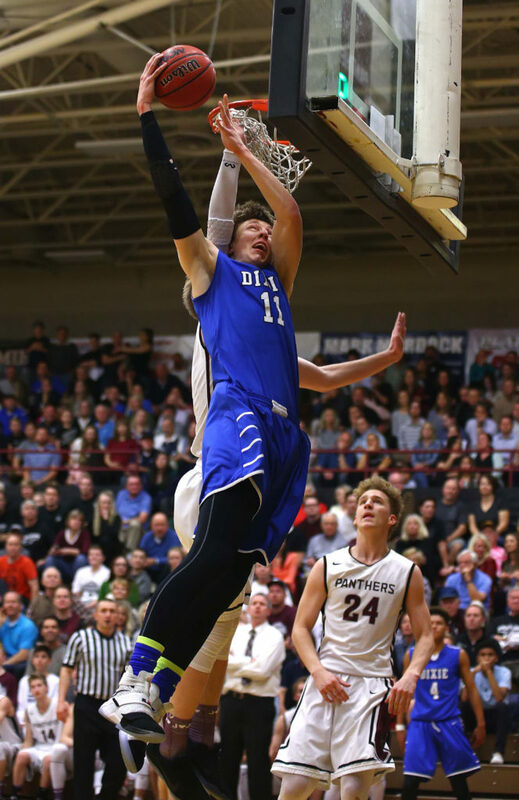 While the Thunder were winning at Snow Canyon, Pine View was doing D-Hills a favor by beating Dixie. The combination of those two events leaves the Thunder all alone in first place heading into the final Friday of Region 9 play. At the other end of the region, thinks got a little tricky as Cedar beat Hurricane to create a tie for the fourth and final playoff spot with a game left. The Redmen avenged a 28-point loss to the Tigers a few weeks ago by winning at Hurricane. Even the Warriors are still alive in the playoff hunt. It should be a fantastic finish Friday night. Some games have that one shining moment, when momentum changes and one team emerges from the fight. 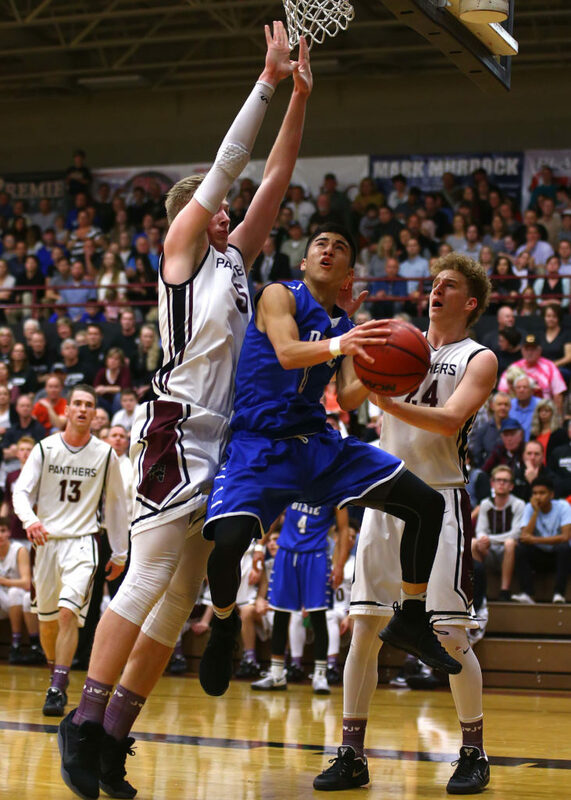 For Pine View, it came in the closing seconds of the third quarter. The Flyers had opened the second half on a 12-2 run to turn a 30-26 deficit into a 38-32 lead. The Panthers fought back with a Trey Farrer basket and a 3-pointer by Kade Moore to make it 39-37 with under a minute left in the quarter. Reserve guard Ty Koller entered the game for Moore and promptly scored inside on a dish from Farrer to tie the game, 39-39. 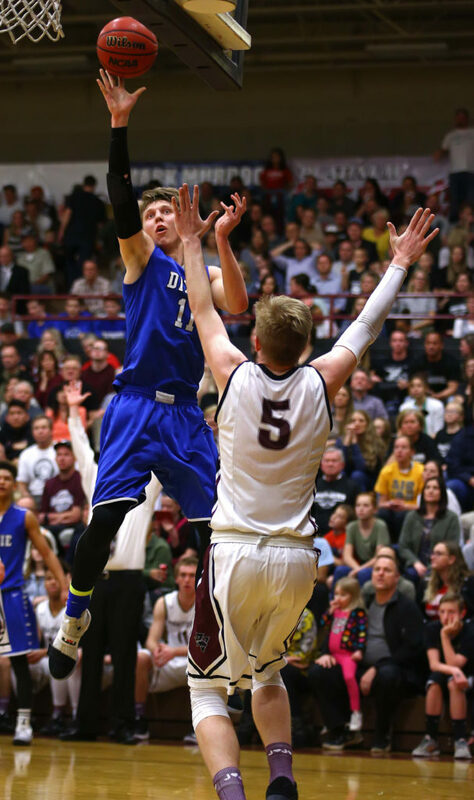 Dixie held for a last shot, but the ball was knocked loose and players from both teams went to the floor. Koller somehow managed to wrench the basketball free from the scrum and get it to Kyler Vaka. 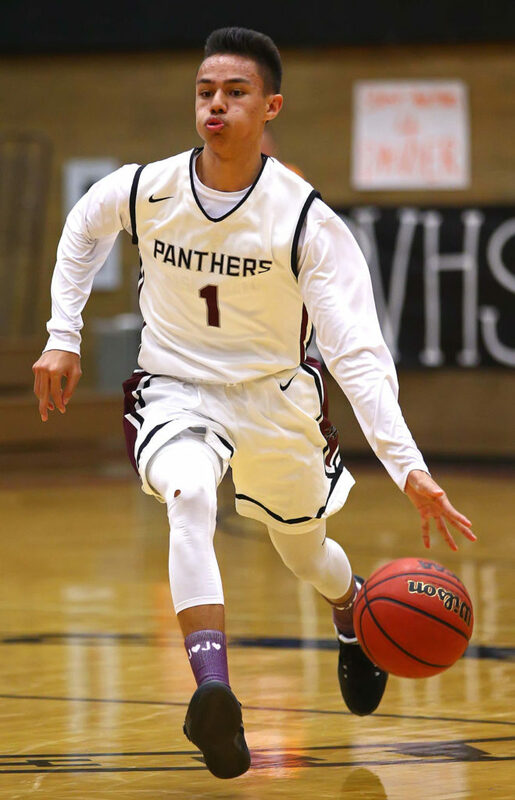 The Panther point guard sprinted down the floor and hit a gliding layup in heavy traffic just before the buzzer to give Pine View a lead it would never relinquish. Vaka then hit two shots to start the fourth quarter and the Panthers pushed the lead to 51-42 after a couple of scores by Dylan Hendrickson. The lead grew to as many as 13 late in the game, which included a highlight-reel slam dunk by Hendrickson. Moore had 17 points and four assists and made 3 of 6 from beyond the arc, plus nailed four straight free throws down the stretch when Dixie was trying to climb back into the game. 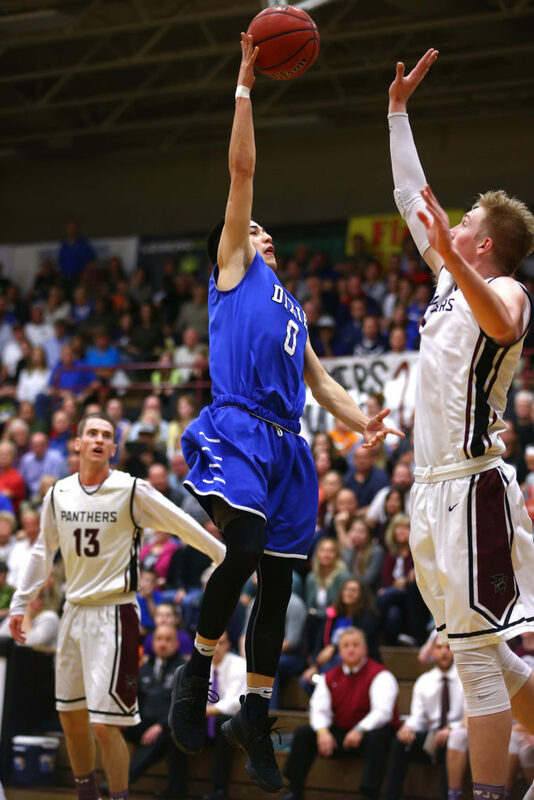 Dixie led most of the first quarter, but back-to-back treys by McKay Lambert and Moore gave Pine View a 17-14 lead after one period. With the score 19-16 early in the second, Pine View scored seven unanswered on a trey by Moore and baskets by Hendrickson and Tayler Tobler to forge a 26-16 advantage. It was a 30-26 PV lead at halftime, but Dixie owned the first six minutes of the third, with Korbyn Elzy, Richard Guymon and Ty Curtis sparking that 12-2 run to give the Flyers their biggest lead (six) in the third quarter. Along with Moore’s 17 points, Hendrickson finished with 16 and Farrer had 12 points. Both big guys ripped down nine rebounds. 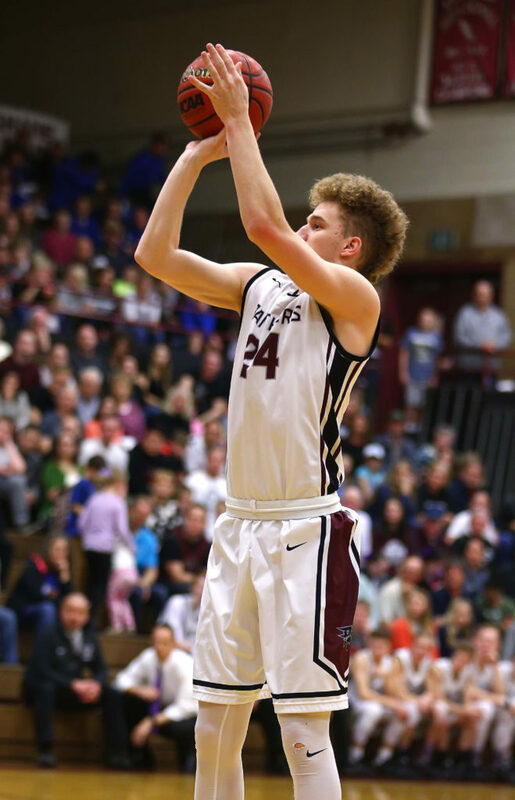 Pine View was 23 for 40 from the floor and made 5 of 15 3-pointers. The Panthers were 9 of 13 from the line. 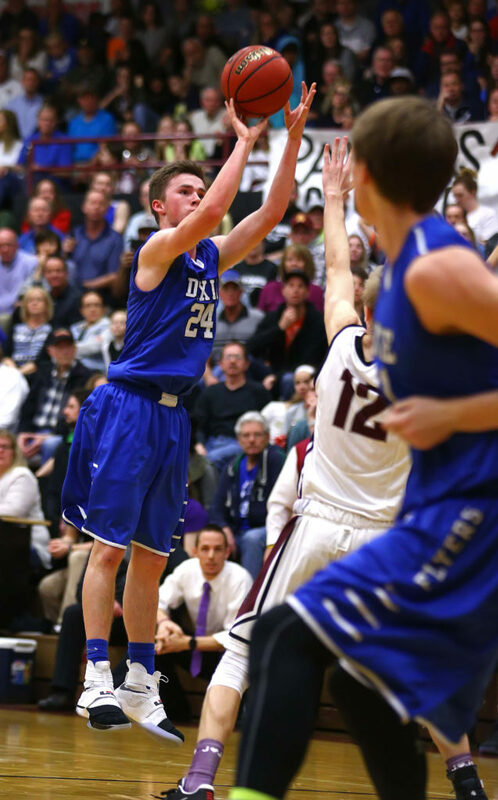 Dixie, which has lost two out of the last three games after starting the year 19-0, struggled with shooting the ball. The Flyers made just 18 of 49 shots (37 percent) and 8 of 15 free throws (53 percent). 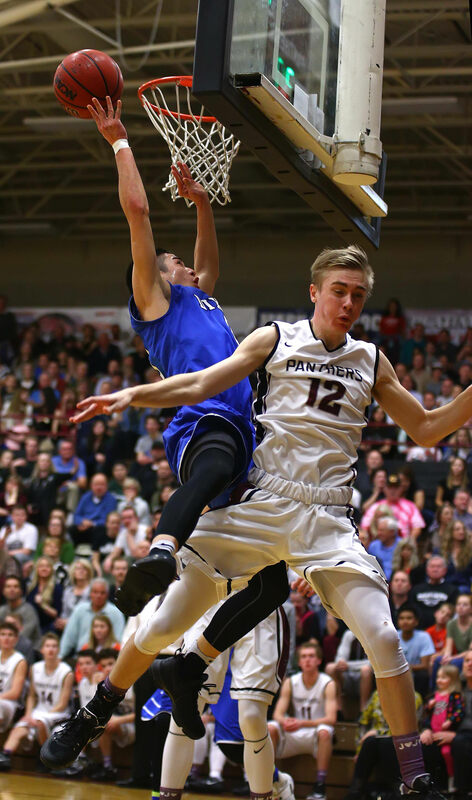 Pine View, 17-4 overall and 7-2 in region, finishes the regular season with a road game at Desert Hills Friday. A win would give the Panthers a share of the region title. A loss would likely send the Panthers on the road in the first round of the playoffs. 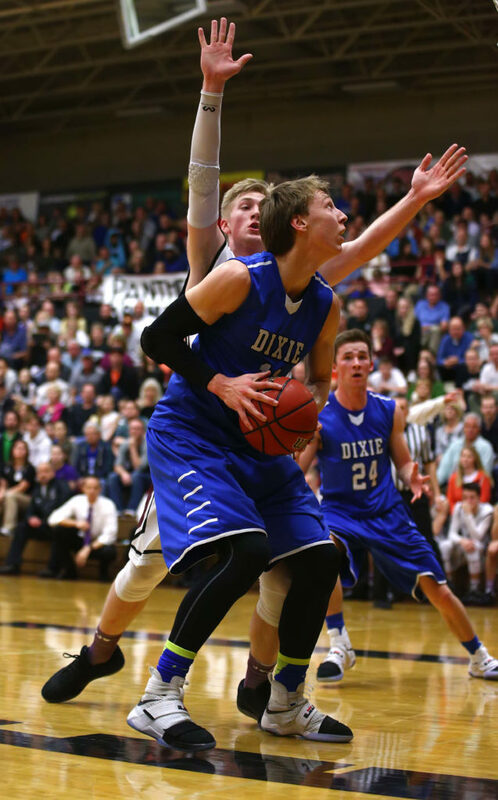 Dixie, 20-2 overall and 7-2 in region, goes to Cedar Friday to close out the regular season. The Flyers beat the Redmen 63-49 in late January. No one’s going to send the first five or six minutes of this game into the basketball Hall of Fame, unless the Hall is looking for an example of how not to play pretty basketball. Four minutes into the contest at the Jungle, Snow Canyon led 4-3, with the two teams combining for eight turnovers and a slew of missed shots. But Tanner Turley seemed to have a cure for the Thunder disease. With just over three minutes left in the quarter, Turley hit a 3-pointer from the corner that sparked a 7-0 DH run. It was 10-4, though Tyson Deland converted a three-point play for the Warriors with 24 seconds left in the first to make it 10-7. Cade Thorkelson’s 3-pointer to start the second gave Snow Canyon some hope as it tied it the score at 10-10. But Jacob Mathews scored at the other end to spark a 9-0 Desert Hills run. The Warriors again surged, pulling to within 20-17 on an inside basket by Bryson Childs. But the shooting touch of the Thunder had returned and D-Hills would close the first half on a 9-0 run over the final 2:43. Mathews had a three-point play and Cam Clayton and Logan Hokanson each hit a 3-pointer to make it 29-17 at the half. DH would push the lead out to 40-19 in the third, but Hokanson received a technical foul for taunting after he scored inside. The T seemed to spark Snow Canyon, which then scored 13 straight points to cut it to 40-32. However, Hokanson’s runner at the third quarter buzzer made it 42-32 and the Thunder pulled away in the fourth. The first-place Thunder beat SC by 43 the first time around, so no one would have blamed them if they had been overlooking Snow Canyon. Whatever the case, the Warriors battled hard, with Braden Baker scoring all 17 of his points after halftime. He made 7 of 10 field goals, but was only 3 for 8 from the free throw line. 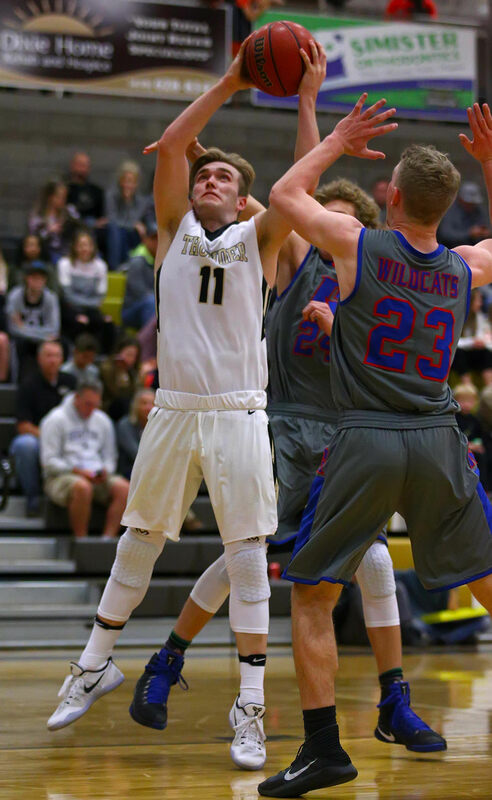 Desert Hills, which finished 23 of 47 from the floor (49 percent) and 15 of 21 from the line (71 percent), was led by Hokanson’s 17 points and five assists. Tanner Turley had 15 points, five rebounds, five steals and four assists. Mathews finished with 12 points and Clayton had 11. Christian Sullivan was the only other Warrior in double figures as he had 12 points. Deland had six points, but left the game after injuring his ankle in the third quarter. Kolton Waggoner had five points and eight rebounds. SC was 19 of 49 from the floor, 38 percent. Desert Hills, 18-4 overall and all alone in first place in the region with an 8-1 record, will close the regular season with a home game against Pine View. 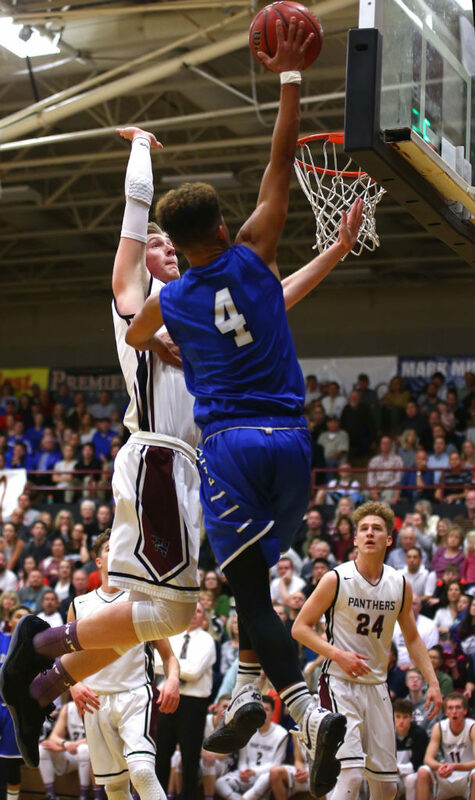 A win for DH would clinch the region title outright, while a loss would mean a share of the title with the Panthers and, perhaps, the Dixie Flyers. DH beat PV 47-44 in late January. Snow Canyon, despite just one region win, is still not eliminated from playoff contention. The Warriors, 7-13 overall and 1-8 in region, are a game behind Hurricane and play at the Tiger’s Den Friday night. Cedar is also a game ahead of Snow Canyon and hosts Dixie. A three-way tie, possible if Snow Canyon and Dixie each win, would mean a coin toss with the winner getting the fourth seed and the loser participating in a play-in game for the No. 3 seed. Talk about motivation. About three weeks ago, the Tigers went up to Cedar High and blasted the Redmen on their own court by 28 points. It was a bloodletting, a home blowout the size of which Cedar hadn’t seen in years. One big element missing in that first game was one big guy: Mason Fakahua. The senior post player made an impact Wednesday night, scoring 17 points and yanking down eight rebounds. 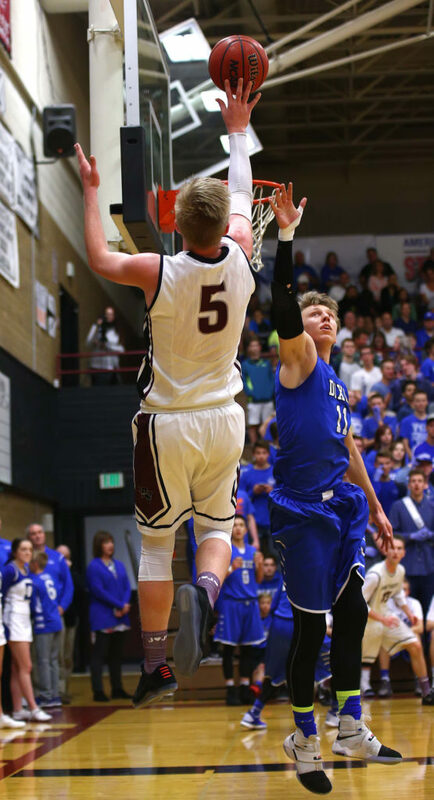 Beck also praised the play of guards Keenan Nielson and Ethan Boetcher. 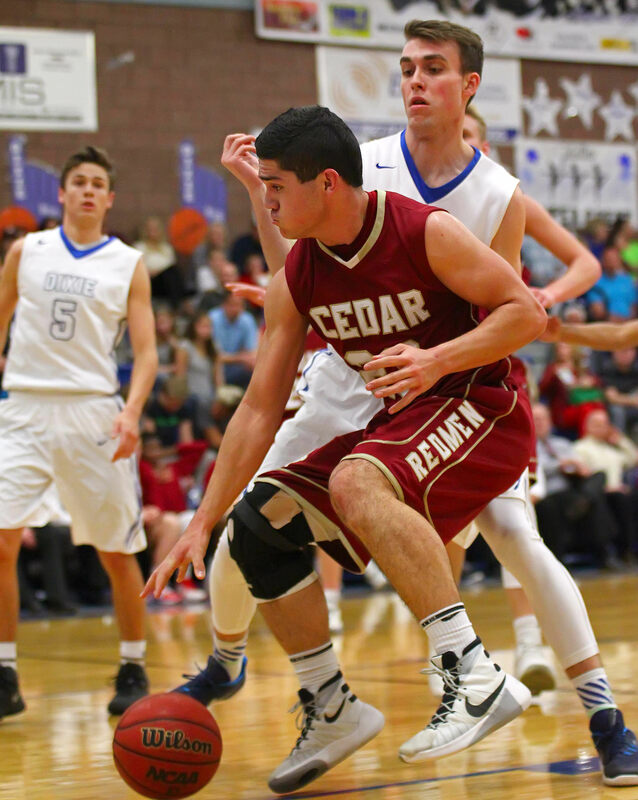 Cedar never trailed in the game after opening up on an 11-0 run. Boetcher had a trey in the stretch and Parker Haynie scored twice. Hurricane rallied to pull within 16-14 midway through the second quarter when Jackson Last buried a deep trey. But Fakahua scored inside and Boetcher and Nielson combined to make five straight free throws to push the Cedar lead out to 23-14. It was 32-18 at halftime and a pair of Nielson freebies made it 34-18 before the Tigers made one last push. Reagan Marshall scored on a three-point play, then hit a 3-pointer to cut it to 34-24. After the teams traded baskets, Josh Parker pulled Hurricane to within 36-29 with a 3-pointer with under five minutes to go in the third. 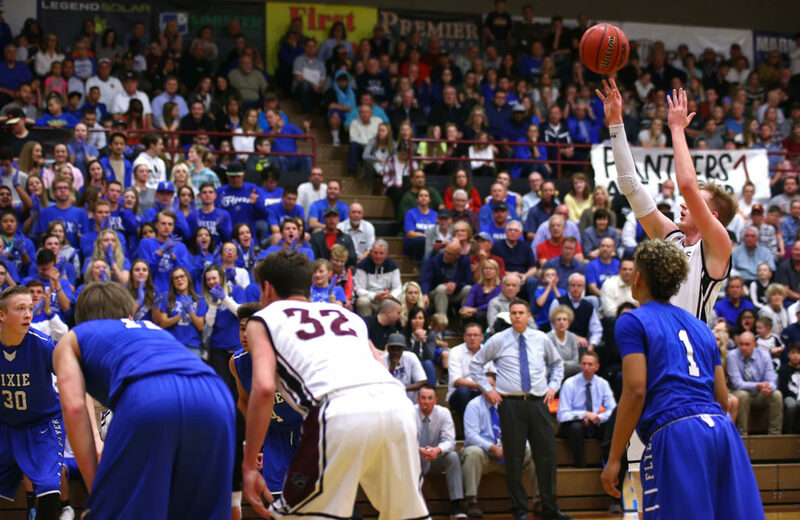 But that’s when Boetcher silenced the Hurricane crowd by matching Parker’s trey with one of his own at the other end. It was 47-35 after three quarters, but Cedar put the game away early in the fourth by going on an 8-1 run, with Fakahua and Boetcher scoring four each in the run. Cedar, which got 19 points, eight rebounds and six assists from Nielson, outrebounded Hurricane 34-26 and shot the ball well, making 20 of 38 from the floor (53 percent). Boetcher and Fakahua had 17 points each as the Redmen, 10-12 overall and 2-7 in region, will host Dixie in the regular-season finale Friday night. A win would guarantee at least a play-in game for CHS, while a loss coupled with a Hurricane win vs. SC, would leave the Redmen out of the playoffs. Hurricane, 12-11 and 2-7, was led by Last’s 13 points and Marshall’s 11. 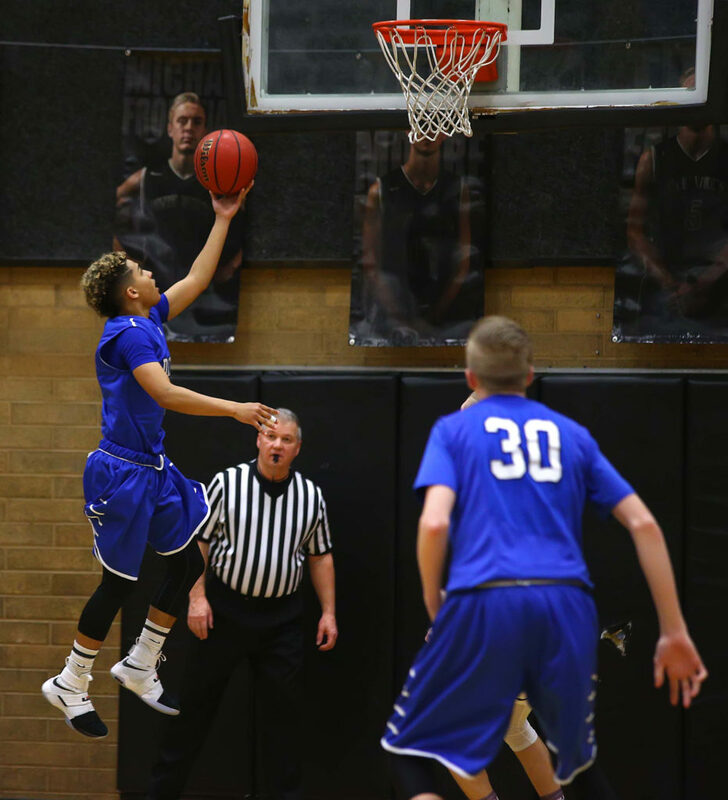 The Tigers, who were just 13 of 43 from the floor in the game (30 percent), host Snow Canyon Friday and will clinch at least a tie for fourth with a win over the Warriors. 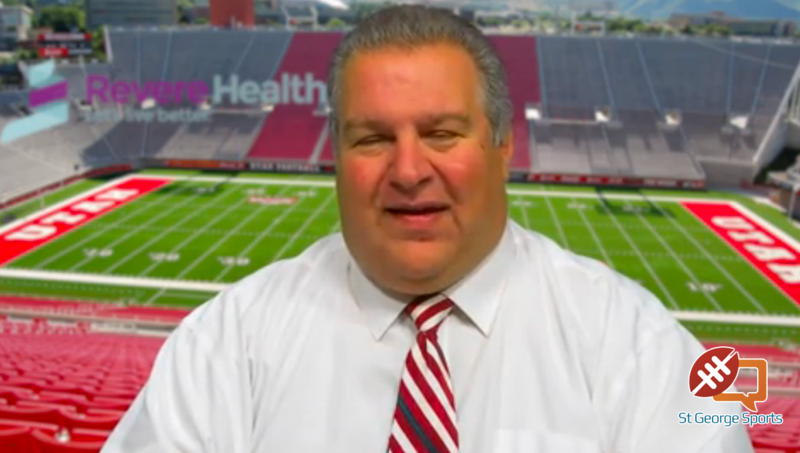 A loss could create a three-way tie for fourth, which would lead to a coin toss.